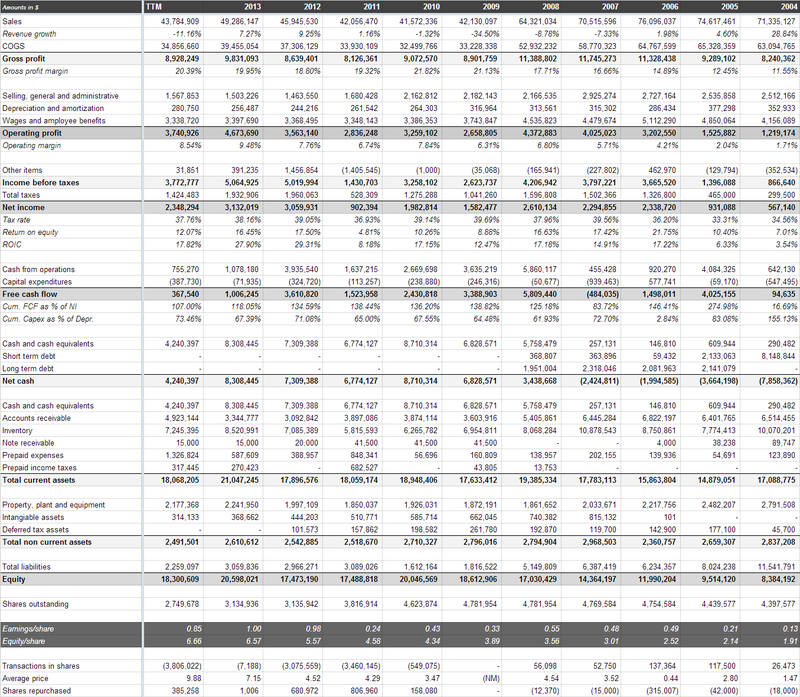 Jewett-Cameron Trading: a cannibal at fair value? The favorable impact of the shrinking share count is clearly visible when we look at earnings per share. Despite little progress in the business itself earnings per share have almost doubled compared to 2008. When we look at the development of the revenue numbers it’s also clear why the stock has been a poor performer for the past three quarters. 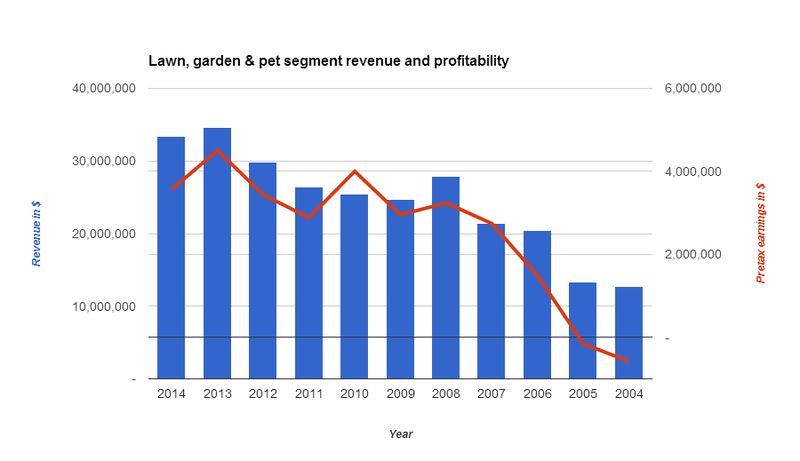 Revenue is almost back to the 2009 level, and it now appears doubtful that this company can grow at a meaningful rate in the future. 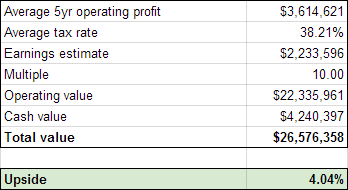 As is visible this valuation indicates that the company is trading at roughly fair value, and the implication is of course that the share repurchases aren’t generating an above average return on capital. It’s in my opinion still an excellent use of cash. Buying your own stock at a 10x multiple basically means that you are generating a 10% return on your money. That’s a lot better than having it linger in a bank account like so many other companies are doing. 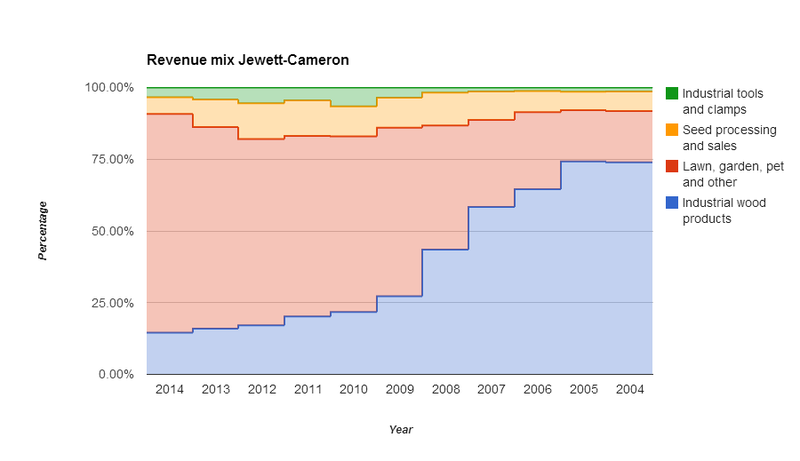 Jewett-Cameron is a very interesting company, but unfortunately not very cheap and that significantly reduces the value that is created by buying back shares. Buying back fairly valued shares is in theory a neutral transaction, except that it is usually better than a lot of alternatives (hoarding cash, growth acquisitions and dividends depending on tax situation). Luckily Jewett-Cameron is not expensive either, and at the current prices it will probably generate a fair return for shareholders. Perhaps that it could be a great idea when you have some specific opinion on how the housing market in the US will develop, and how that will impact Jewett-Cameron. But that’s not a prediction I want to make or can make, and since there is not much of a margin of safety at current prices I’m staying at the sidelines. No position in Jewett-Cameron Trading at the time of writing. This entry was posted in Research and tagged JCTCF on July 17, 2014 by Alpha Vulture.